Here is the second quick and easy appetizer. I don't remember where I got this recipe since there is only 3 ingredients to memorize. I must have seen on Food Network. There is not much to say about it, it is easy as 1 2 3. 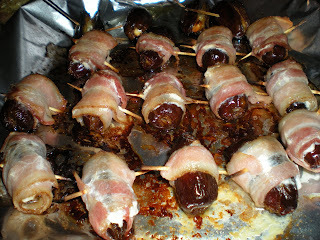 Important : do not omit the bacon since it actually burns the dates and it doesn't taste good without bacon. 2. Cut one side of the date and take the pit out. 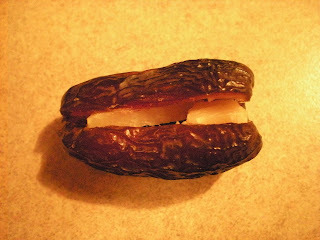 Stuff a stick of cheese into each date and seal it. 3. 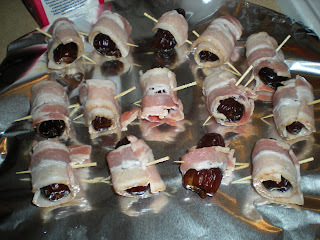 Wrap half a slice of bacon around each date. Secure it with a pick. 4. Bake 5 mins, then turn dates over, bake until crisp, about 5 more mins. Drain in a paper towel and serve. I made a similar appetizer for New Years. Instead of cheese, I used almonds to stuff the dates.